I'm going to take a slightly different approach this time. Instead of treating it like a Let's Play or a documentary, I'm going to make this more of an After Action Report, it might be more suitable to me. So to start off with, why am I sharing this game? Because I've failed near a dozen times to achieve the results I've wanted from this one save. Actually trying to adapt my strategy leads to humiliating failure. I may have to be objective and just discard my strategy. The most important part of any game of AI War: Who is my enemy? ...I'm just going to skip the analysis of why many of my strategies failed. Let's just say that Eyebots and Vampire Claws were involved, and cascading power failures that Logistics Command MK2 don't help with any. Well regardless, there are a few interesting situations to share. The Version 7.001, with Dyson 4, Devourer, Fallen Spire 4, Spire Civilian Leaders, Broken Golems/Spirecraft/Botnet (Moderate), Dark Spire 4, Showdown Devices, Dual Avengers. It's just nine and a half hours of game time and near twelve hours of real time, I lost track of my SP game. When someone's PC chugs along at ten frames per second at the start of the game on -low- caps, I'm afraid to ask if they're running this game on a netbook. A different game the next day went a bit smoother with ultra-low caps and an amazing thirty frames per second. Back to the feature sp game. Seven hours in, 307 effective AIP, 387 actual. 8500 spare K. Free energy: 135,448. One Cursed Golem, One Spire Outpost. 8 systems colonized. Six neutralized but colonized, unraided for knowledge. Five liberated civilian spires (all uncolonized). If you have a mind like a steel trap, you'll remember I've often said there was too much power available from energy collectors, and how I assumed only low AIP games would have any trouble keeping their power up. Well, my attempts to continue this session had me running between 2 and 9 Matter Converters as systems started failing. With two Matter Convertes and 8 energy collectors I'm producing 1,338,000 power and spending 1,202,552. This boggles my mind, as I haven't even built spirecraft, and am running one relatively inexpensive golem, no botnet. It's beginning to show why I had so many cascading power failures and attempting to counter with more starships or spirecraft would be futile at best. 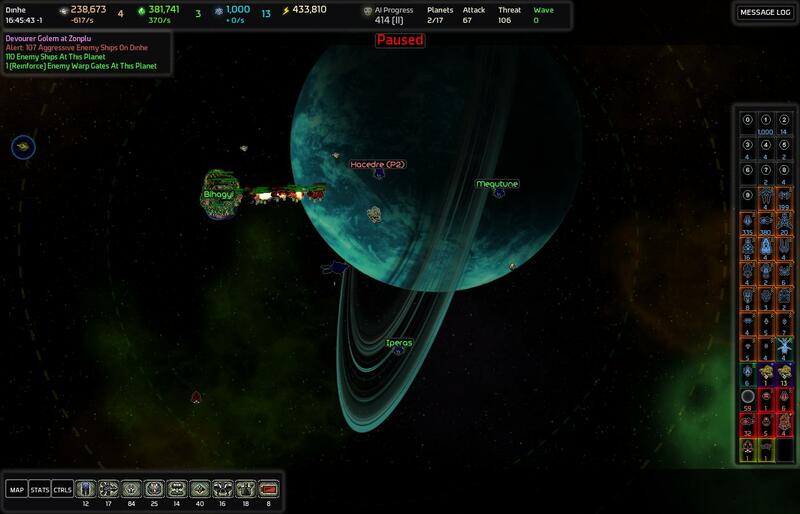 Screenshot 1: The galaxy at large. The first planet of interst: Mibuboat; to the west of my northern chokepoint. I've proven in the past that I can take down Dire Guardians with my fleet, I'm not to woried about that. 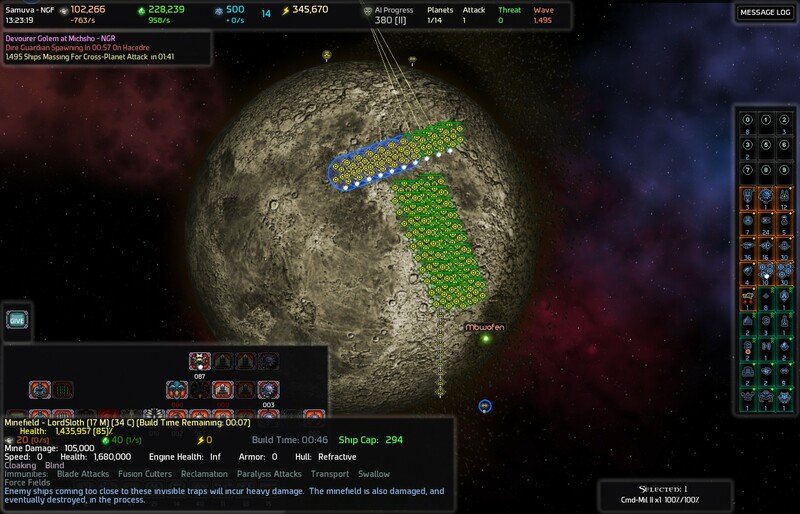 Sure there is a Fortress right next to the wormhole, but that shouldn't be a problem... I've got polycrystal heavy bombers and devestators. What I didn't originally notice was the TWO Plasma Guard Posts MK III right between the Dire Guardian Lair and the Mark II fortress. This system is also of the "Lobber" sub-commander type, complete with Munitions Boosting Command and guardians, for a nice 2.00X attack boost, or a cool 11 milllion damage alpha strike (splash damage! ), complete with whopping huge engine damage, a Dissembler guardian, and a few etherjets and parasites to subvert any fleet strikes. The two systems to my north aren't particularily exceptional except for having, in order, a Vengeance Generator and another Dire Guardian Lair (etherjets are bad here too). To my east, I'm facing a nice MK3 system with a black hole machine, just in case any vampire claws decide to strike at my command stations. After that is a nice MKIV with another vengeance generator and an obstructionist subcommander. Heading back down south, I've a couple of Advanced Factories... but since I was so focused on having a thief and parasite, I've only unlocked mk2 fleet ships, and it's not like missile frigates can counter vampire claws. I had a few nice attempts at craking the southwest, but then I'd either get hit by Vampire Claws, or the Devourer would eat all my ships/spirecraft, or various other downward spirals of failure. With all this in mind, I'm going to temporarily scrap many of my Harvester Exo-Shields, swap my lovely frontline of Logistics MK2 with Military MK1s (lasers weren't helping enough with vampire claws), and see what I can do to preserve my frontline. With the proper recognition of whom I'm fighting, I should be able to to be a lot more effective. The question is, where should I head, and what should I do? I'm first going to focus on my power consumption, certainly. But is there no effective counter to vampire claws and a distributed front line than military commands? Mini-forts, forts, laser turrets, etc haven't seemed to help when I'm spread out like this. 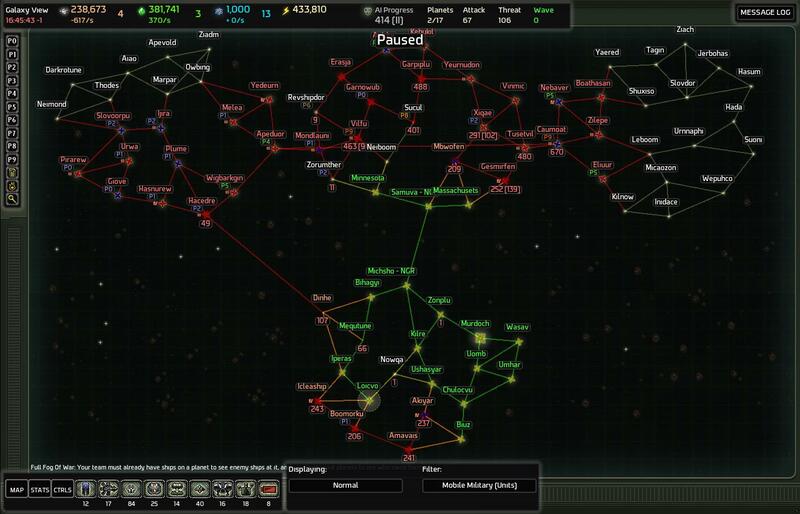 Still, Military should nicely ease the problem, but I have 8500 K to spend in order to crack the AI planets and keep myself alive at the same time. More to come later in this week. All my strategic analysis got thrown out the window when I realized I was completely mistaken about who I was fighting. I need to completely re-evaluate, but fleetships and starships are still kind of no good until I decide where I can cut my power consumption. I could go crack that MKIV Advanced Factory system in the southwest and get fleetships that won't get anywhere in time to fight vampire claws. I could try to break through the nasty systems up north and take advantage of those freed systems, but I enter mibuboat from entirely to close to the Fortress there. So my questions are rhetorical this point- I'll provide a breakdown of my possible/attempted & failed targets next time, though I could certainly use some suggestions on handling Vampire Claws when stealthed tachyons and miniforts and MK2 lasers aren't enough (but military command might?). But anyways, Derp. A military command respec and dismantling of major power consumers seems to be the very first starting point. I am losing about 10 AIP an hour so there is no immediate pressure except the next CPA that will utterly destroy me (about 100+ Spire Stealth Battleships), of course. Establishing more systems would only make the upcoming power crisis more critical as I get hit with more eyebots and more claws. I might be able to make my way to hit a couple data centers if teleporters don't slaughter my Raid Starships, Sniper Guardians and Disassemblers don't ruin my day. If I go fleet, I need to be prepared against parsites, etherjets, murderous stealth hordes... And the ever-hungy Devourer Golem. 2). Improve counter to Parasite and Stealth AIs, while cracking through hardened systems. 4). Survive Dark Vengeance without hopelessly antagonizing them or the Dire Guardian Lairs, one of which is permanently on alert. 5). Secure my systems and most importantly power supply in such a fashion to keep them alive even in the face of a heavy stealthed and parasitic CPA. 6). Reduce my AIP through Data Center raids by 40 points, while surviving the fleetships released as threat. 7). Watch my AIP go down over time while still progressing forward.
. Cartharsis through AAR, clearing my mind of previous garbage misconceptions through forced reflection. Etc... etc... I really got myself frustrated on this one by simply failing to properly check the stats screen. Task A: Swap all frontline command stations to military. Recolonize Biuz in the south for extra power, being wary of Dark Vengeance Generator. I will not be colonizing Mischso or Nowqa on account of co-processor and superterminal. I will be colonizing Mischso despite lack of supply for speed boost, perhaps? Task B: Take out SW Data Center in the system of Boomorku. -Nowqa is a superterminal system, already cleared. 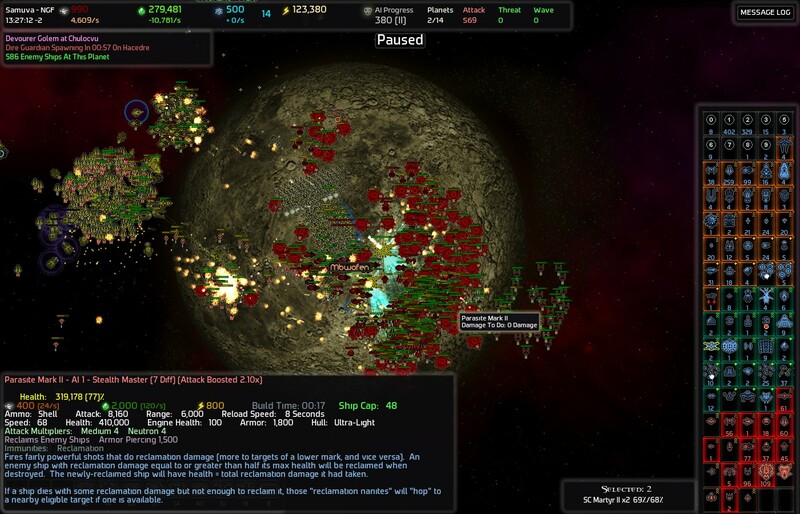 -Loicvo is a rapidly reinforcing system with three Ion Cannons and an AI Troop Accelerating Command Station. I'll need to deal with it eventually, but for now I'll head down south through the already neutered system of Amavais with my full fleet and Decloakers. -Boomorku is moderately defenseless, but the presence of an Advanced Factory will draw the patrol (cloaked). I'll need to deploy scout starships at the wormholes and my fleet with decloakers for support. Up in the NW, there is another Data Center at Cauamoat. This one will be a bit tricky to reach. The two worlds adjacent to Samuva (Mbwofen and Mblinqui) have a vengeance generator and a black hole machine. What's more, Xiquae has a Dire Guardian Lair I want to avoid triggering. On top of all this, I may need to pull back my fleet for defensive duties. -Send a Transport full of fighters to Gesmirfen, a MKIV Translocator command station system, to take out the Tachyon Sentinels there and in Tustevil. -Send in Raid Starships with Cloaker Starships to take out the Data Center in Caumoat, while hoping not to set off any Raid Engines in nearby unscouted systems. Offensive operations will be supported by as many Matter Converters as I can maintain. After the Data Centers go down, I will fall back to defensive postions, scrap a majority of my matter converters, Harvester Exo-Shields, deploy a significant EMP & regular mine network. Bihagyi and Boomorku both possess Advanced Factories. If I can crack it, I'll take Bihagyi on account of the superior position, but Boomorku is much easier to crack. Right now, my fleet is in possession of Scouts MK2, Fighters MK2, Bombers MK2, Frigates MK2, Zenith Medic Frigates MK1. Starships are Flagships MK2, Zenith Starships MK2, Raid Starships MK2, Neinzul Enclaves MK2, Scout Starships MK2, and Devastators MK2. I have Engineers Mk2, Logistic Command Stations MK2, Havester Exo-Shield, Decloakers, Force Fields Mk2, Fortress MK1, and Mini-Fortress. I have Lasers MK2, Stealth Tachyon Beam Emitters. I have 8500 knowledge. If I can get an Advanced Factory before the next wave, I'll spend 4000K on Bombers MK3. I'll need them to counter Stealth Battleships, along with 1250K Tractor Beam Turrets MK2 and (unlocked) Stealthed Tachyon Emitters. I unfortunately cannot hard counter Vampire Claws with Missile Frigates, so I'll have to spend my remaining 3250 K wisely. I may pop that co-processor system, grab the K, and unlock Military Command Stations. Does Vampire Claw Missile Immunity make sense right now? There's nothing in the default human toolset that hard counters them. Missile Frigates cannot hurt them, no starships other than Riot Modules have a hull multiplier, Zeniths cannot touch them, there is immunity to tractor and engine damage. Starships do have immunity to Fusion Cutters, however. Equivalent, let alone lower marks of fleetships don't help any under most cases losing handily. Their speed is high enough to prevent kiting. Would Radar Dampening make more sense? What do you guys do to counter Vampire Claws other than Military Commands? I can't quite figure it out, but my cursed golem helps. The Military Command doesn't do much to protect Energy Collectors. I'm going to be executing this plan now and toss up another update in a few hours, hopefully a positive report. P.S. Can anyone tell me why Xiqae is on alert and generating a Dire Guardian? I do not have any ships outside of human controlled territory other than scouts, and there is an AI controlled system between it and my territory. My best guess is the Devourer Golem is putting the systems on alert. My newly refortified (Mil Comm) systems are holding nicely (though I haven't been antagonizing Vampire Claw MK3s this time around). Spire Frigates have been deployed down south to hold my system with the Vengeance Generator, two miniforts, and an energy collector. Power is holding steady at around 400,000 with Cursed Golem on and two Matter Converters. I managed to take out one of the Data Centers, but the other is heavily enough defended that any Raid Starship that approaches gets Alpha'd by the two MKIII Missile Guard Posts and one Anti-Starship Arachnid Guard Post MK3. Thanks to the Data Center and Spire Civilian Leaders, my AIP has dropped to a somewhat more reasonable 278. It's near 1 AM, so further action must take place tomorrow. 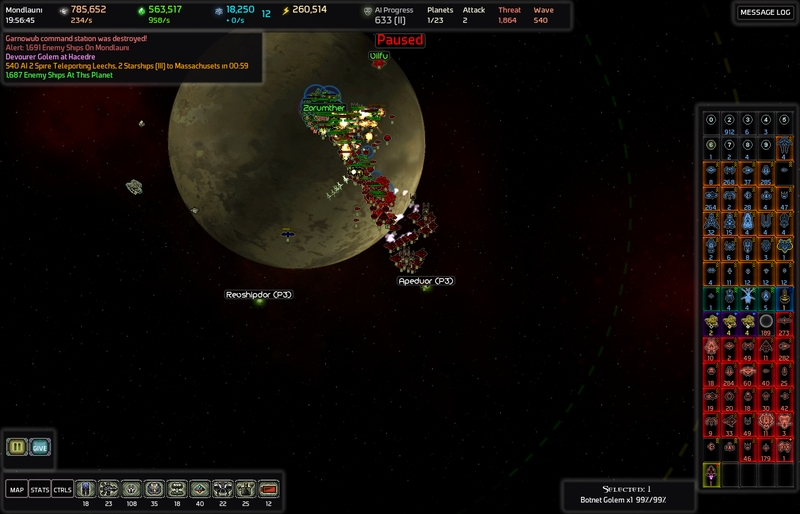 Proper blobbing with decloaker support has helped eliminate most of the threat from my offensive manuevers, but Raid Starships have kicked up a decent chunk, along with retreating cloaked ships. Rather than an Advanced Factory, I'm considering moving my Whipping Boy to Mblinqui, with its Black Hole Generator. The mark IV planet of Gesmirfen is a bit of a concern, SubCommander and all, but not a critical one. Not sure how important that data center is to you, but Mark II Raids are both missile immune and certifiably awesome (nothing like a lightning fast, force field-piercing strike ship that is immune to its hard counter...). 1,495 ships massing for cross planet attack (feeding parasite, stealth master). Unlocks of note: MKIV Fighters, Bombers, EMP Mines, Riot Starships MK2, MK2 Gravity Turrets, counter-sniper turrets. I hit another stumbling block with this latest CPA, and had intended to set up and test some new defenses. Unfortunately, the AI refused to split up its attack force like previously, allowing me to concentrate my forces quite nicely. I blame the devourer, I had hoped to see if I could manage getting attacked simultaneously from two directions like before. Less ideally, when they hit my former chokepoint, the mines were laid out on the path to my fortress, not my command station. Key to my economy this time: turn off FRD. I didn't want to repair that Botnet Golem. The old Large Project Cutoff of 400 doesn't really work with 250 m/c. Since I've survived without excessive casualties, I'm going to rewind an autosave and get some screenshots. My strategy involved: Mine Spam (regular, emp), Gravity, Tachyon, Tractor turrets at each -important- entrance, rush building Riot Mk2s, cracking the co-processor system south of my homeworld for rushed knowledge, power. Screenshot 3: Incoming. Screenshot omitted for point of redundancy. It hit my choke Samuva from the north (or insystem wormhole just south of that command). Screenshot 4: Welp, guess I shouldn't have moved those mines after all. 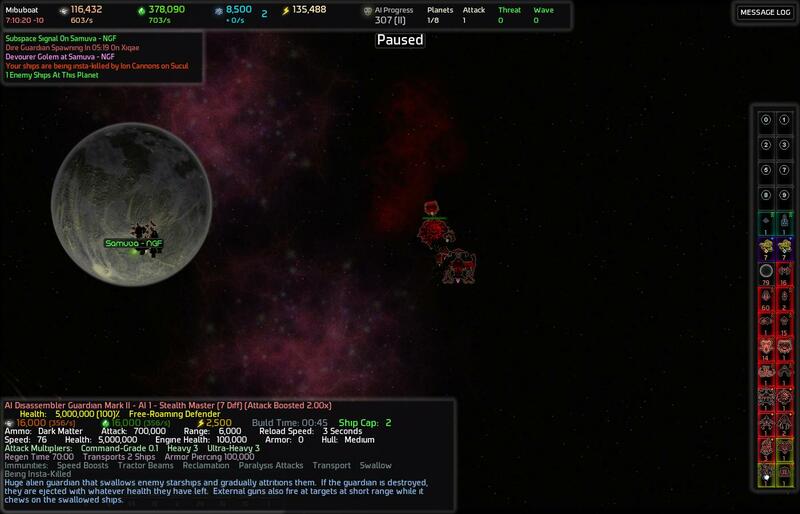 Screenshot 5: Divide and Martyr. Screenshot 6: Victory at Small Cost, but a Lot Less Bombers. Note: Basic martyrs MK2 only deal 2 million damage. SSBs MKII have 3,850,000 health. Recommended? Bigger panic button. First Spire Colony Ship Constructed, still zero hubs. Captured Zenith Power Generator, puts me at 400,000 power with cursed golems. Botnet still cannot go online, I would need a second Zenith Power Generator. Repair continues with a single MK1 engineer. 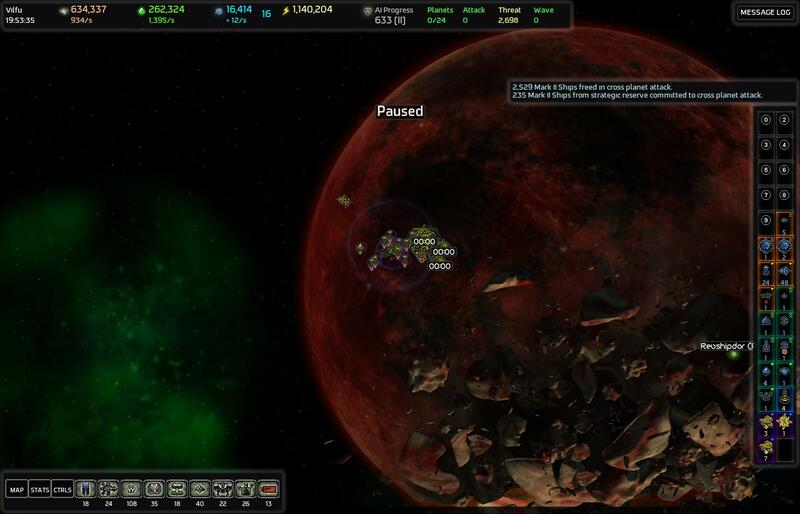 MK1&2 Forts distributed at key systems along my borders, along with an unlock of MK3 Force Field Generators. CPA announced at hour sixteen. 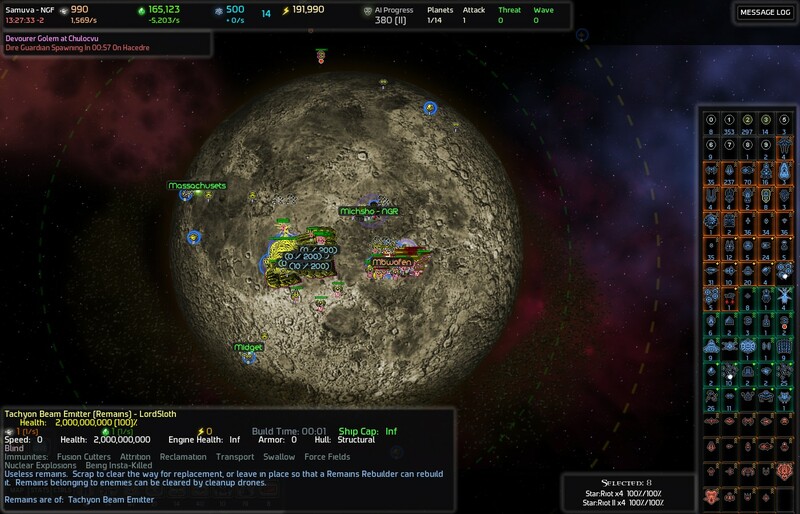 (I need to be much more efficent with my forces, Spire Civilians or no I spent a lot of time and resources rebuilding, or I would have afforded a city (and habitation centers) already. Roughly 1,800 ships inbound. Unexpectedly easy, stumbled across some cheese. They headed for the western entrance to my home cluster. My entire fleet (Riots MK2 and Cursed Golems and MKIV Fighters, Frigates, Bombers included) moved into Dinhe, to get as much range out of the Cursed Golems as possible. When CPA met Human Defense Force, I almost held out the fight right there, but then decided to pull back to player controlled advanced factory system Bihagyi. 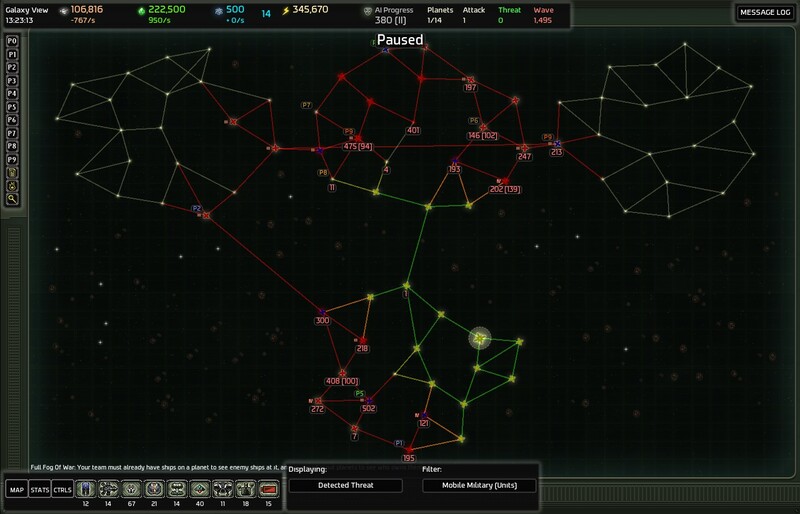 Thing is, once I left the system, the AI forces did not pursue. Their intended target was Mequtune. Once I noticed this, I moved my miniforts and rally point to my side of the Bihagyi system and repeatedly warped in and out of the system. 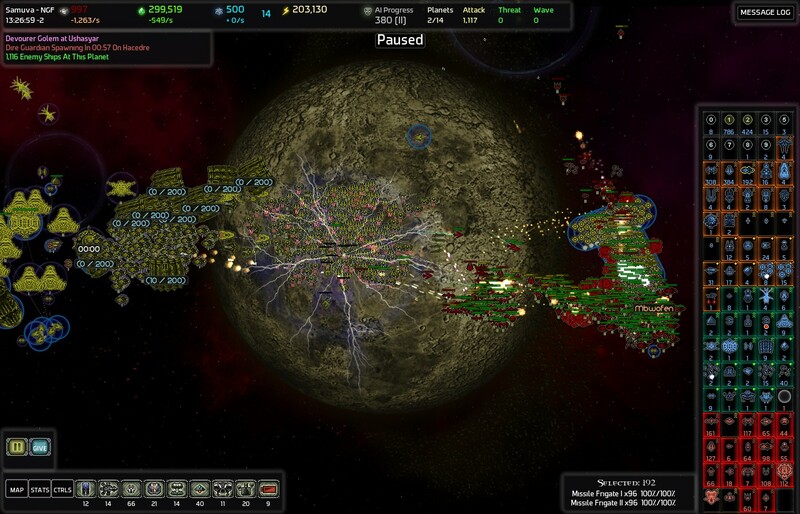 Thanks to Riot Starships (Basic Standoff Models MKI & II), The AI forces strung out between those two wormholes making for extremely effective defeat in detail. The only ships that made it to my planet Mequtune were some Sniper Mark II. 66, to be precise. They were of absolutely no threat to my fabs due to some prior Counter-Sniper Turret construction. The martyrs were rather ineffectively used on the offense. They would have been more efficient waiting in ambush. As you can see, casualties were rather minimal. I probably would have been able to practice -some- of this same cheese in my own systems thanks to gravity turrets, EMP mines and better martyr positioning, so I don't feel too badly about this. I do wonder if CPAs should ever retarget to an 'inter-system' pursuit mode, but then that would be just as exploitable, if not more so, if you could always just lay mines and such in the path. I had been expecting to have plenty of screenshots exhibiting my continual downward spiral, I'm kind of sad that I don't. I didn't even lose a single regular power generator. Returning back to golems for a moment, I could easily pick up a Black Widow Golem during the sweep, which would further aid in CPA cheese, but what I really want and haven't yet found is a blessed Regenerator golem. Over to the west, Apeduor has the Dyson sphere, sadly neglected. If I linked up with that, I would have a nice buffer against those Dark Spire. I have an unwelcome number of AI Eyes in the northwest cluster, unfortunately. 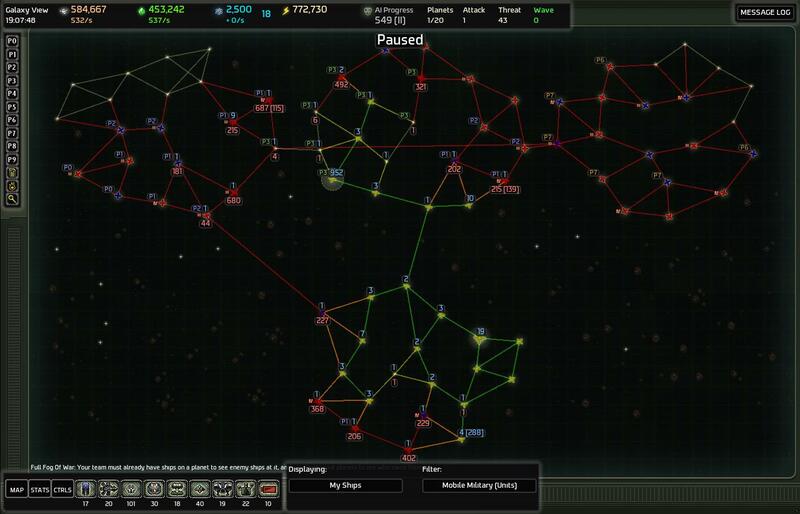 That NW cluster has some nice stuff, but is mostly off limits due to laziness and also missile posts under FF, and lack of Artillery/Armored Golem. The state of my economy: 1814 'revenue' M/s, 1874 'revenue' C/s. 3,184,000 Power generated, but 2,750,190 consumed. Total AIP: 645. AIP Reduction: 231. AIP Floor: 129. Effective AIP: 414. Tech threshold 3 reached at 730 AIP, if I want those stealth battleships to be just that much more painful. Either way, while I've got my economy finally balanced thanks to that first Z. P. Gen, I really want to get Harvesters MK2. It'd make the bigger projects so much easier. So, I ended up popping the ARS system for Laser Gatlings... I decided hacking over a V. Generator wasn't my best idea ever. I've picked up a second Zenith Power Generator, activating my Botnet Golem for another 100 AIP. I've also picked up my third Cursed Golem from the Gatling ARS. I've liberated the Dyson, gone on several clean sweeps of the galaxy... I'm eagerly anticipating the next CPA. I've got some excellent fabricators that I would have to hack thanks to their position if I patched to the next version. Zenith Siege, Zenith Starship, Gravity Drains. Unfortunately, I'm trying to hold off on updating till I finish this one co-op game on Sunday, perhaps. I've got the economic chops and then some, though raiders can and will take out my botnet capability (energy). I'm building some MK3 Fortresses in an attempt to shut down the Vengeance Generators... we'll see if that helps. After that, I'll see about reviving the Black Widow Golem, grab a few possible fabricators, shift front lines, do excessive warp gate raiding, and then finally, after about 20 hours, build the first Spire City. Because while I am honestly curious on how high I can ramp this AIP, I can't resist the new toys.. and as a test, this game would be skewed by the presence of all the considerably unbalancing minor factions. Well, didn't reach my target AIP, unfortunately. I'm only at 633 AIP. I didn't even have to bring my Cursed Golems over from ye old Whipping boy to deal with a couple of incoming waves. Best of all, the MK3 Fortresses held in my backwater- the CPA had to pass through some Dark Spire Infestation, I presume, not to mention the Dyson Sphere system, though it barely hindered it. Nothing got loose to cause me trouble back there. Overkill probably, but truly comforting. Why did I do so well against so many units, despite the admittedly OP Botnet? While I didn't have my cursed golems around, I still did well enough to have over 200 of each fleet type left after the fight. Here's my conclusion, some of which is obvious, while some would be new to non-alpha testers. I could afford MKIV fleetships along with everything else thanks to the K cost tweaks. This made for a fairly strong blob. MK2 Starships of varying categories, but most importantly, Riot MK2s. Shield for durability, with lasers, shotguns, machine gun turrets, and most importantly Tazers to immobilize any pesky vampire claws who reach the squishy center of my deathball, as well as slow down everything with an engine, enhancing my effective manueverability. Four Spire Frigates glass a few close proximity stealth battleships. Nienzul Enclave Starships MK2. The drones don't help combat the hordes much, but what they do do is distract and delay the Spire Stealth Battleships quite nicely. This lets me carefully edge my Spire Frigates into range of just one or two stealth battleships at a time, rather than see them effectively clump up. I saw over 70 at one time, IIRC. MK2 + I gave me 48 drone pulses, enough to effectively keep the Battleships out of firing range despite their radar dampening. Scout Starships MK2, Cloaker Starships MK2 provided protection from Snipers, Sentinel Frigate, Eyebots, Infiltrators, etc. I didn't even end up fighting the AI on my territory, except for one piddling system I colonized to give my MKII labs access to four systems a few hours ago. Lessons: Enclave Starships, even MK2 are amazingly helpful tools for dealing with Spire Stealth Battleships. I am ...considering... taking them off my most hated list of AI unlocks. I need to blob with Tazers more often, laugh at those melee ships. As a side note, Dire Guardians showing up made things a bit more difficult. I've ran into a series of Unhandled Errors. I've filed a bug report with a save where the issue reoccurs, but I cannot recreate the issue going back to a previous save and attempting to play things out the save. I've just about gotten my Second Spire City up, but I'm going to have to replay on account of above errors., I've decided Railguns are the answer to Stealth Battleships. I've creeped up into the 700+ AIP range, but I'm going to slow down my expansion a bit now that I've grabbed some spare systems and a Gravity Drainer Fab. Blue is my initial plan for Spire City Hubs (though I'm debating whether to put down the capitol, or just grab three and finish the game). Red is my alternate plan for the Spire City Hubs, which, when possible, places them down over a Vengeance Generator and the Superterminal for maximum cheese/freeing up fortress MK3. This all took a while because the site next to my planned second hub was a translocator command station with four MK3 warp counter attacks, while another had an eye I had to deal with (three cursed golems took care of that). With the dutiful neutering, I was able to direct the counters into the relatively unimportant northern cluster. Protector starships are related to this? I've had one of these too in my huge game that didn't reproduce when I reloaded the safe, and I've got a full compliment of protectors. They could potentially contribute because their mode of countershot (being finite) actually involves a lot more memory because it's not sufficient to track one counter-shooter per ship per ammo type, it actually has to track them all. But in general it shouldn't be too big a deal. I haven't seen them previously, although I just recently started seeing Shield Guardians and Spire Corvettes. ...If they're memory related, that might explain a few things, and my membership of Browser Tabs Anonymous. As to recently unlocking Enclaves 1-4+Merc, Having Zombies (with the Botnet) when I usually try to avoid reclaimators and zombies in general, there might be a few excess ships on the field. You mean to say there might literally not be 2 GB of RAM available for AIW on your machine. In 2013? I'm pretty certain I've the memory to spare somewhere in a 64-bit operating system with 16 gigs of ram. But something as frequently updating as chrome, with new flash plugin (and other extensions) updates happening automatically, with a slight dose of java on top of it probably has some memory leaks somewhere out there interfering with something.